For one of my first nights in Charleston, a friend took me to Umami - a new sushi restaurant in the East End. Umami is supposed to be the fifth sense of taste - most often the mushroom is used as an example for this flavor. 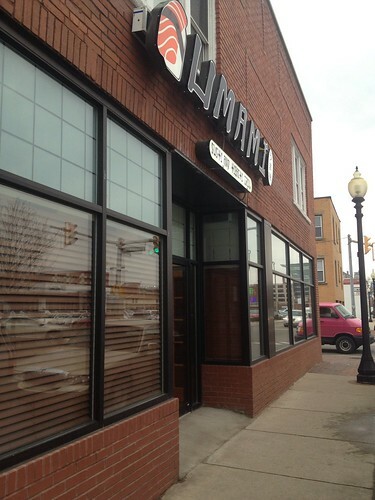 Umami is located on Washington Street East, next door to the locally famous Main Kwong. The owners of the two businesses are said to be friends. Parking is around the back of the building, and I haven't seen that get too busy yet. 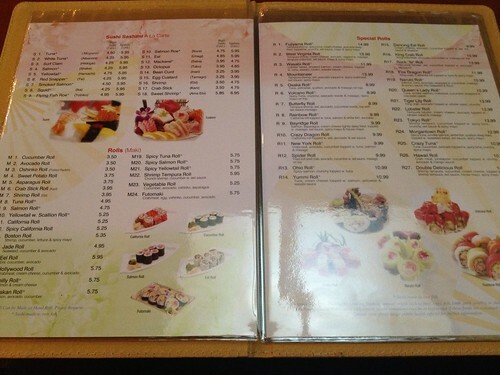 The interior has clean lines and vibrant colors, and the menu has around 100 dishes, many of which being sushi rolls. I like that they denoted the rolls without raw items. 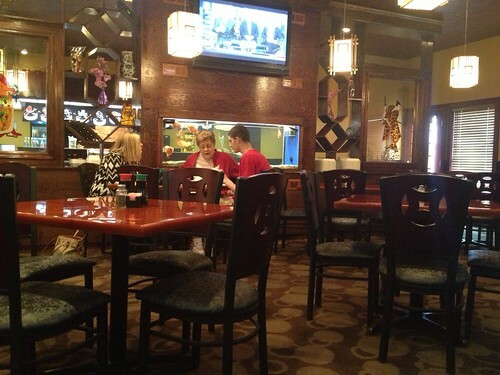 They also have a hibachi grill. 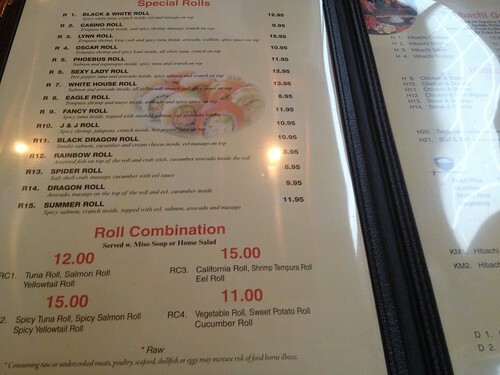 I got a spicy California roll and an eagle roll. 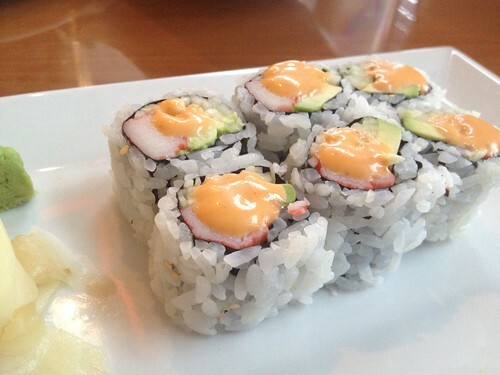 The spicy California is pretty straight forward, but I did appreciate their spicy mayo sauce. It had a little tang, but not too much. 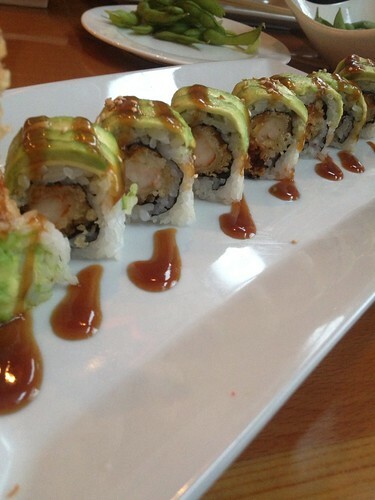 And the eagle roll was pretty tasty - tempura shrimp, avocado and spider sauce. 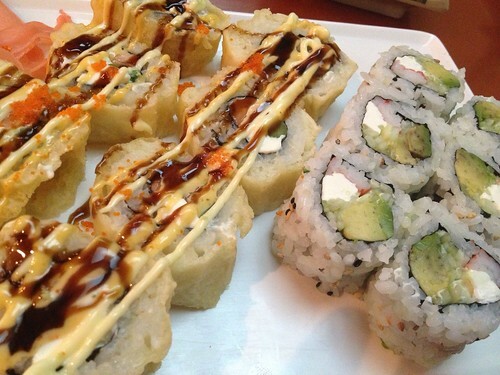 I think the difference between mediocre sushi and sushi that blows you away is the freshness. 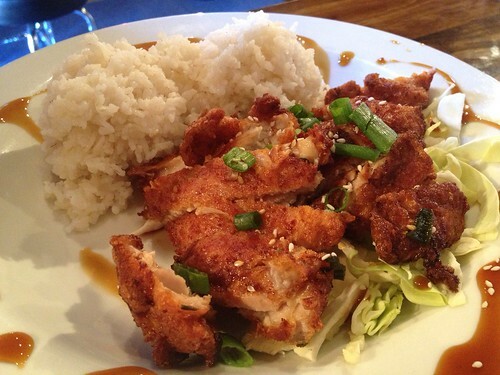 Umami is fresh. Simple ingredients, but fresh and prepared correctly make all the difference. For under $15, you can't really beat it. 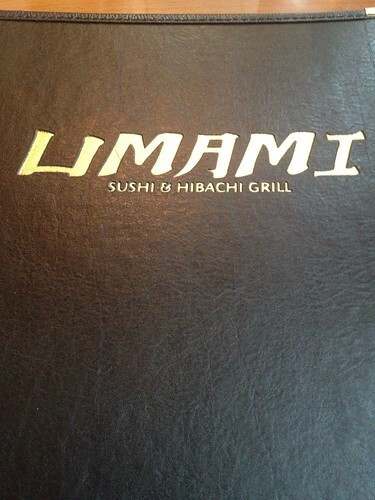 Umami Sushi and Hibachi Grill, 1401 Washington St. E., is open from 11 a.m. to 2:30 p.m. and then again from 4 p.m. to 10:30 p.m. Monday through Friday. On Saturday, it is open from 11 a.m. to 11 p.m. On Sunday, it is open from 11 a.m. to 10 p.m. 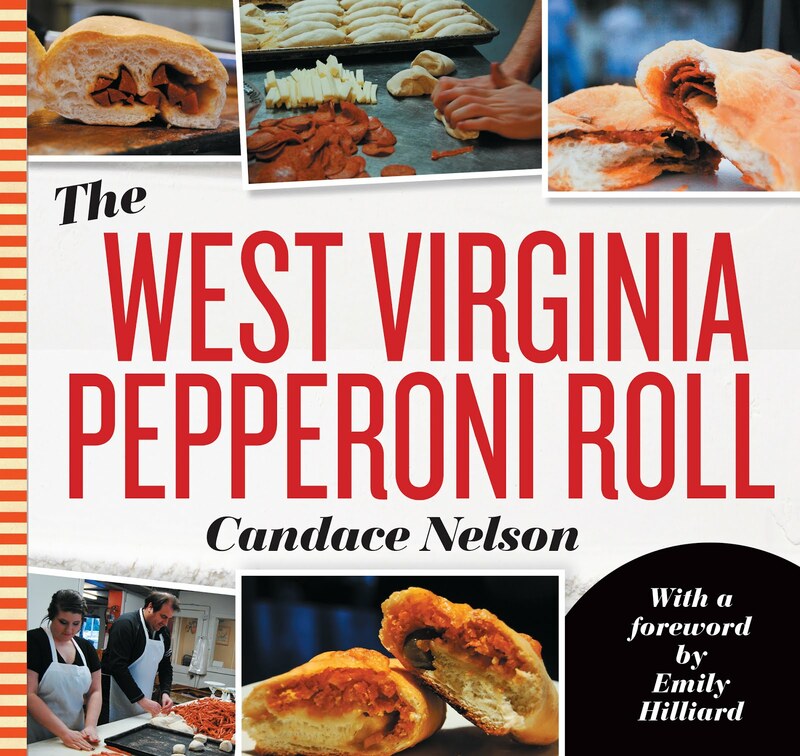 Call 304-343-8989 for more info. 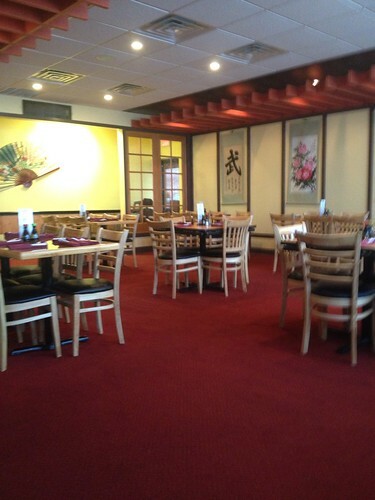 I went to Fujiyama in Fairmont a while back because I just wanted a change from Morgantown sushi joints. 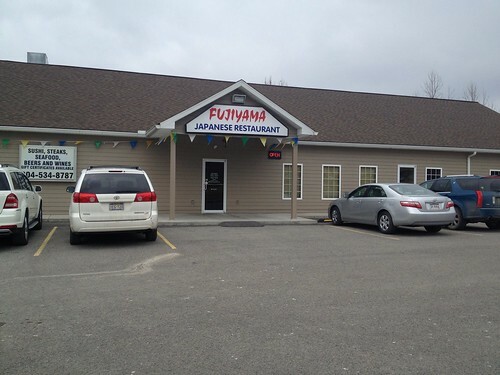 It seems as though there's a small chain of Fujiyama Japanese Steakhouses, but this one looks to be unrelated. Located at 422 Marion Square, the restaurant instilled some trepidation in my veins upon approaching it. The area doesn't seem to have been updated very recently, and the building? Looks like a solid double-wide trailer. Walking inside, though, is a different story. The decor is sleek and elegant. Not something I was expecting. But it is modern and made me feel more at ease. 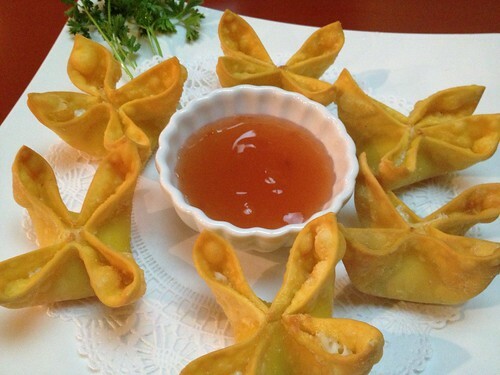 I ordered crab rangoons that were out. of. this. world. I really have developed a preference for the super creamy, indulgent ones. Most takeout places have this blocky, chunky mixture inside, but this was the opposite. Something about the crunchy exterior and the smooth center does something to my tastebuds. This just got all sorts of romantic novel-like. Moving on. I ordered two rolls: a boring Hollywood Roll - cream cheese, avocado, crab roll. I tend to do these "buffer" rolls in case I'm not a fan of the other. Can you go wrong with crab, avocado and cream cheese? Not in my book. It's always a solid choice. The other roll I ordered was the Bayridge Roll, and it included salmon, asparagus, crab, and cream cheese, and was topped with masago, eel sauce, spicy mayo and house mayo. It was different, but also tasty - maybe the combination of a thousand sauces making it sweet and tangy had something to do with it. Fast-forward a year or two, and I'm ready to check out their new location in Cheat Lake. 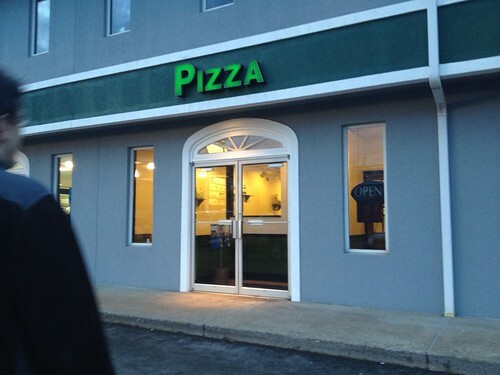 I had my eye on this place because it used to be "Cheat Lake Pizza 'N Pasta," which didn't sound much too appetizing. 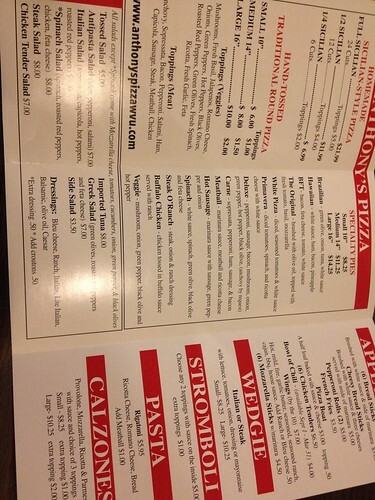 Luckily, Anthony's can reuse the incredibly descriptive "Pizza" lettering above the shop. 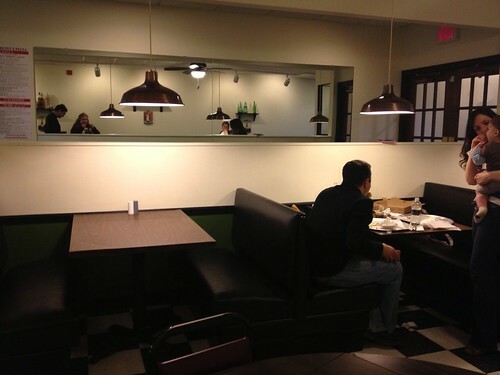 It's much larger inside than I anticipated, and there are a few booths and tables if you choose to dine in. 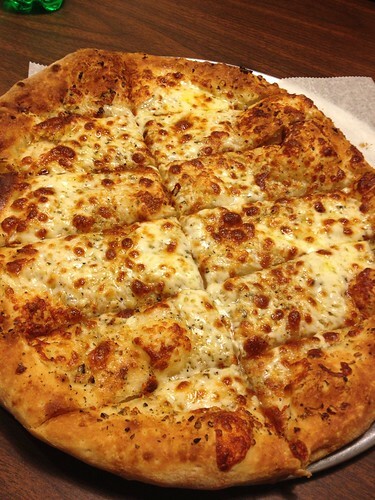 I decided to keep it simple this time and just got a cheese pizza and some breadsticks. The breadsticks were just ... bland. Could've used a generous amount of garlic and another coating or two of cheese. Maybe I'm being overly critical. They were just average. 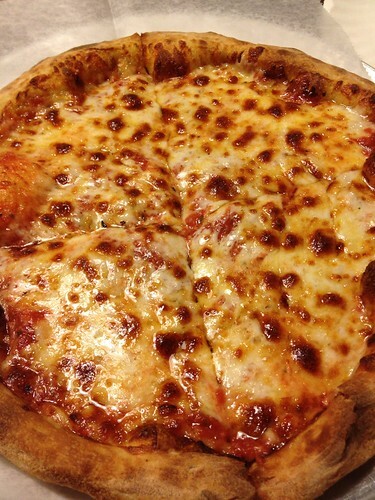 The pizza, too, fell into that category. The pizza was pretty greasy; the sauce tasted canned. I liked my pizza even flatter than this. 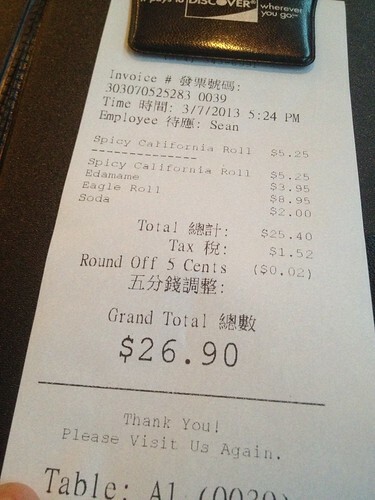 While my order was correct, and the people working seemed great, I just wasn't impressed by the food. 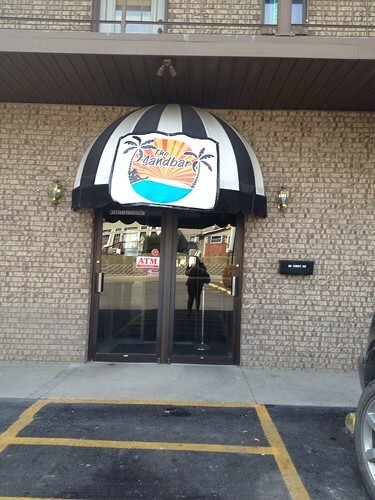 The Sandbar is a new bar and grill in Westover that boasts itself as a slice of paradise. 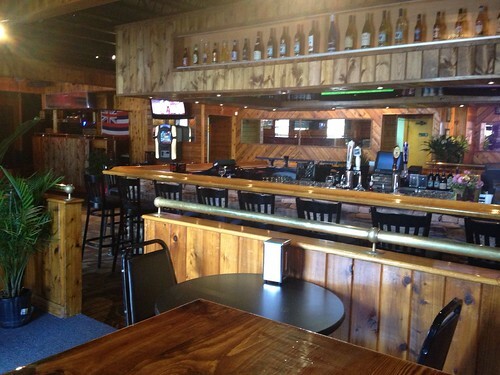 It's located in the former Weezie's Pub and Club location, at 417 Holland Ave. This Hawaiian-inspired bar has an area for tables and chairs, as well as a dance floor. The interior has what looks like new finishings and lots and lots of wood. 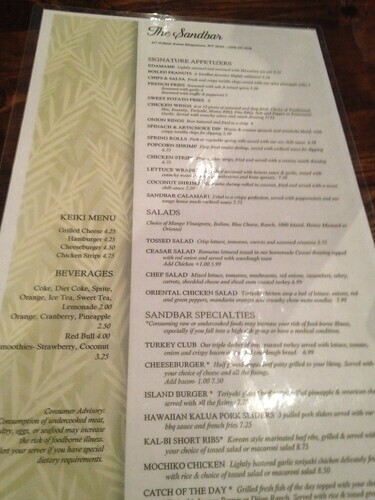 The menu has items like lettuce wraps, coconut shrimp, burgers, sliders and ribs. 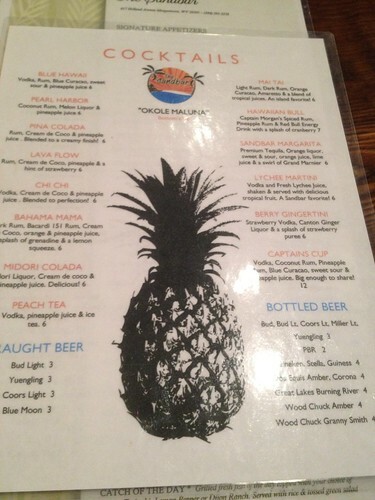 They also have a whole menu of themed cocktails. 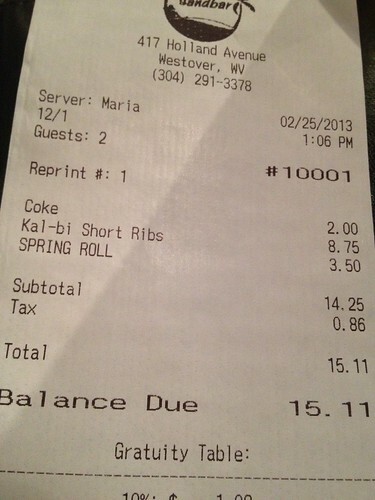 My friend and I ordered pork spring rolls, and for our main entree, we asked the waitress what she recommended. She told us their ribs and their chicken dish were really good. So we each got one so we could try both. 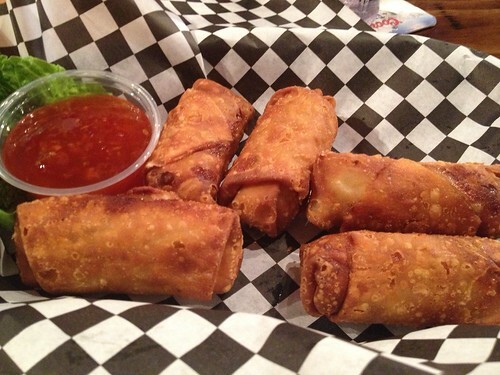 The spring rolls were really tasty. Were they homemade? I doubt it; but they were pretty good. The sweet and sour sauce was like a sweet chili sauce - pretty good. The main entree, though, was nothing to write home about. My ribs didn't have bones? I was kind of surprised - pleasantly surprised - by that, but not until I tried them. 95% of the pieces were grisly, fatty, chewy and just all around not good quality meat. The sauce on top was sweeter, but I think went better with the chicken dish. The chicken was much more ultimate crowd-pleaser. I mean, it's chicken. The same sauce was used, but it was clearly made for the chicken dish. Or at least it should've been. 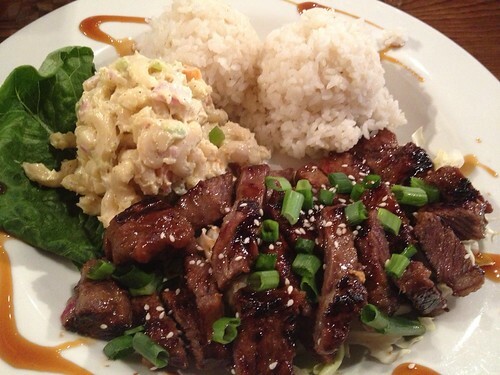 My sides were rice and macaroni salad (my choice). I actually found a small hair, so that kind of did me in. Not a whole lot to say about this one, but in my personal opinion, I'd move along.